There is a huge battle now over the potential to lift the ban on fracking on the Delaware River Basin. There is a lawsuit by a Wayne Co. PA landowners group, who want to become Shaleionaires. This is vigorously being defended by various NGOs at great expense. I think this whole battle is a bit silly. Here's why. Here is a map I've been wanting to make for a long time. The yellow area is the Delaware River Basin. The colored dots are the existing wells in PA (source: Stateimpact). There is almost no drilling in north-eastern Susquehanna County (just under Broome Co. NY), because **there is no gas there**. The Red line is the "Line of Death" (Engelder's term) east and south of which there is no shale gas, because the gas is over-mature. 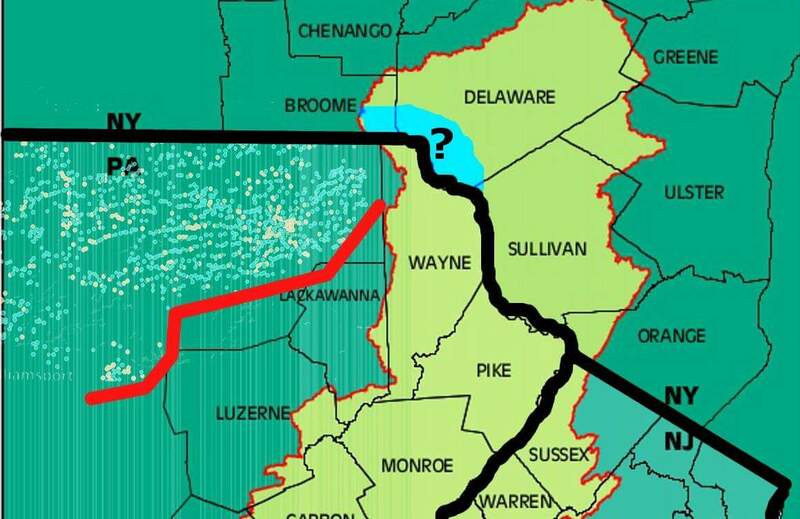 There is almost certainly no viable shale gas in the PA part of the DRB. What is unknown is the light blue area in NY, where there may be the possibility for some low producing wells. But this area is covered by the NY ban. And according to the Fab Four (Northrup, Allstadt, Brock, Acton), this will not be economically viable until the price of gas reaches over $50/MCF. The last I checked, the spot price at the Leidy hub was under $3/MCF. Bottom line: there will NEVER be any wide spread shale gas drilling in the DRB... ever, with or without a ban. There may be some low-producing wells in NY someday (if the DRB and NY bans are lifted), but these are unlikely to happen in our lifetimes, because at $50/MCF, there is no gas advantage over coal. So now that you know, feel free to sign the petition if you want to. The Delaware River provides drinking water for 17,000,000 people, so we can surely boost our number of signers with your help. If you haven't already signed the petition, please consider signing it now. And, whether or not you've signed it, please share it with your friends and neighbors. Please click here to sign the petition or copy and paste this link to share it in email or on social media. http://petitions.moveon.org/sign/ban-fracking-in-the-delaware-1?mailing_id=37876&source=s.icn.em.cr&r_by=1236934Thank you so much for all of your help sending a message to the Delaware River Basin Commission that it's time for permanent protection from fracking!